tl;dr: We go in-depth with Area Venture Capitalist to understand the investors’ perspective on the current state of startups. I recently caught up with Menlo Ventures’ Matt Murphy—at a traditionally overpriced San Francisco caffeine dispensary—to talk about markets and life. I decided to formalize our chat into an interview. Murphy joined Menlo last year, after working for Kleiner Perkins since the preceding millennium. The following exchange took place over email, and has been lightly edited for clarity and length. Let’s go! Mattermark: We discussed valuation multiples. Investor Semil Shah recently said that founders with $5 million ARR heading into their Series A should expect post-money valuations of $25 to $30 million. That benchmark depends on growth, of course. In the current market for Series A and B investments, what sort of revenue growth do you look for? Do you prefer GAAP revenue or ARR, and how much does growth rate impact valuation? Murphy: For early SaaS companies, lets say up to $15 million ARR, you want to see about a 3x year-over-year growth rate. Yes, that is a very high growth rate, but many of the best SaaS companies have been on that trajectory by finding early product-market fit and an efficient sales model. Beyond that point, the law of large numbers catches up and generally the sales model that got the company to that point needs to be complimented with marketing, outbound sales, maybe even field sales. All this is expensive and takes time to perfect. So after that stage, and up to about $50 million ARR, 80-100 percent year-over-year is very good. Then 50-80 percent to $100 million ARR and 30-50 percent after that. For pure SaaS companies, ARR is an easier metric to track as revenue is kind of a lagging indicator, whereas current ARR composed of new bookings, renewals, churn, and upsells is a better indicator of the health of the product market fit and sales/marketing effectiveness. Growth rate impacts valuations significantly. If you are growing below these bands, then maybe your market isn’t big enough, maybe you don’t have product/market fit, maybe you haven’t figured out how to market/sell your product. All those factors weigh on investors and the more they worry about them, the lower your valuation. The more they believe those risks are small, the higher valuation they’ll offer. To Semil’s comment, I would think a company that gets that kind of a valuation at $5 million ARR might have gone from $2.5 to $5 million ARR. Yes, they doubled, but maybe only added the same amount of new ACV as the year before, [raising] questions about how easy it will be to scale up. If the company grew from $1 million ARR to $5 million ARR, the valuation will be twice what Semil suggests in my opinion. Mattermark: Looking back, how has the situation changed from this time last year? Which of your answers is the most changed? Murphy: This time last year, there was a belief that you need to grow great than 100 percent year-over-year all the way to and past $100 million ARR. This is expensive to do and leads to unnatural acts for many companies and unnecessary inefficiency. Capital is now expensive (dilutive1), so the cost of inefficiency makes it much less desirable for both management and investors. The public markets are influencing this point of view as they shifted from rewarding growth at all costs to strong growth and a near term path to profitability. Mattermark: You mentioned “Seven Deadly Sins” for companies looking to raise today. According to my notes, they include having raised too much, having too high a burn, being valued too highly, having off sales-marketing efficiency, and being in a product transition. Which am I missing? Mattermark: Which of the Seven2 is becoming the most painful culprit for why some startups can’t raise their next round? Murphy: I’d say burn rate is the one most investors are most concerned about right now. None of them are good, but investors are concerned about putting money in and having that run out before another round or liquidity event occurs and thus having a poor return. Beyond that, certainly having a hiccup in your momentum or trying to sell investors on your next [product instead of your] current product is very tricky in this environment. Going into a fundraising knowing you need a new CEO or founder transition is something investors would prefer [to have] resolved prior to the round. Mattermark: In our chat, you mentioned that venture capitalists have more time to complete deals today. What is driving longer investment cycles and slower cadences for investors and their investments? Murphy: It’s mostly a function of supply and demand. Beyond that, in environments like this, venture capitalists are spending more time with their portfolio companies, and that takes time away from them sourcing and working on new ventures. Finally, the psychology shifts and when investors are less worried about missing out on the next big thing and more concerned about overpaying or picking wrong, things slow down. Mattermark: You mentioned as well that there is “no FOMO” among venture capitalists at the moment. What does that mean, and how is it a new phenomenon? Murphy: I wouldn’t say none, but it has changed as a driver. When capital is free-flowing and IPO markets are open with many big exits occurring, it creates a certain frenzy, as it makes it appear that its easy to grow big fast and have a big outcome. Well it’s not, and that becomes more apparent when its tough to raise capital and the IPO market is closed or valuing companies at much lower multiples. For example, if you expected a company to exit at 8x forward revenue and the public and private markets signal that the same assets will be valued at 3-4x forward revenue, well, it kind of changes your return hypothesis. 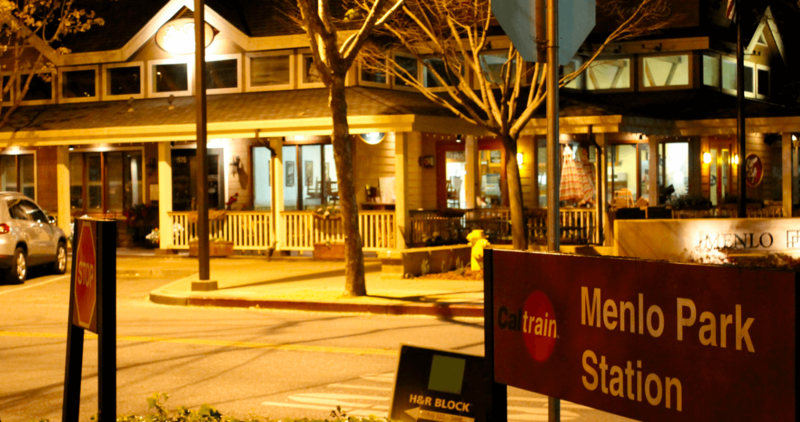 Menlo Park’s Caltrain artery at night. Mattermark: Off our other topics, I was recently asked about founder expectations. We discussed talent partners, which got me thinking. Does the average founder today have too high of expectations for what services, if any, their venture partners should supply their startup? For example, talent assistance and so forth. Murphy: I don’t think the expectations are too high. A founder should expect a lot from their venture capital partner and firm. Firms that can deliver more than what the partner can provide on his/her own have an advantage, as they’ll be more helpful to the entrepreneur. That said, there is a balance and figuring out how to best provide the help and resources is key. Not every company needs or wants the help frankly, and the more disconnected the services are from the main partner, the more it can seem like the entrepreneur is being handed off. Mattermark: Finally, are you bullish or bearish about the startup market from an investing perspective for the next 12 months? Murphy: Bullish. Big macro drivers like mobile, shift to the cloud, [and] global markets make it the most interesting and exciting time to be building a company in my 17 year venture career. Early stage is a great place to be, and with this resetting of mindset on capital efficiency, the next generation of companies will be even stronger. As for the late stage, there are still more mature, large-scale private companies with real business models than ever before. Many have decided to stay private longer, and yes, burn more than the previous generation of companies. But they are still great companies, and the queue of those ready to go public in the next 6-18 months is long. And that is that. Murphy’s candor is, as always, appreciated. My favorite takeaway is the implied multiplier effect that growth brings to it; faster growth rates actually make the same dollar of revenue worth more. It’s akin to what the chemist once told me: Hot water is water, just more so. So it is with new revenue that has a large delta from year-ago results. That, and the coming deep IPO pipeline. If that doesn’t materialize, we can picket Menlo’s offices. Editor’s note: This is a really great example of the price of capital as the inverse of valuation. Game of Thrones jokes are allowed. Featured Image via Flickr user Patrick Nouhailler under CC BY 2.0. Image has been cropped. Middle Image via Flickr user Richard Masoner under CC BY 2.0. Image has been cropped.